Oh my! 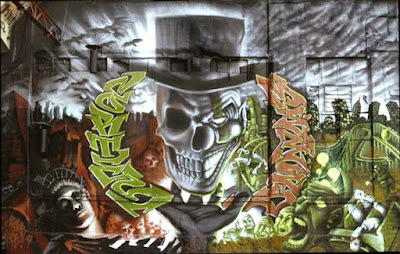 their piece is considered one of the coolest graffiti productions in New York City!! The government's graffiti war continued through the 70s and into the early 80s. The late 80s saw a rapid decline in graffiti and in 1989, the last graffiti-covered subway car was taken out of service. By the 1990s, graffiti artists had definitely hit the mainstream with many starting their own art galleries. The above work is by famed graffiti artists Cortes and Meres, according to Graffiti.org. I remember filming these guys in the freezing cold. It was a mission but they stuck it out, ignored the bad weather and finished the wall. I'm so proud of them. Check out the video I shot and edited displaying the progression and completion of this "cool" wall.